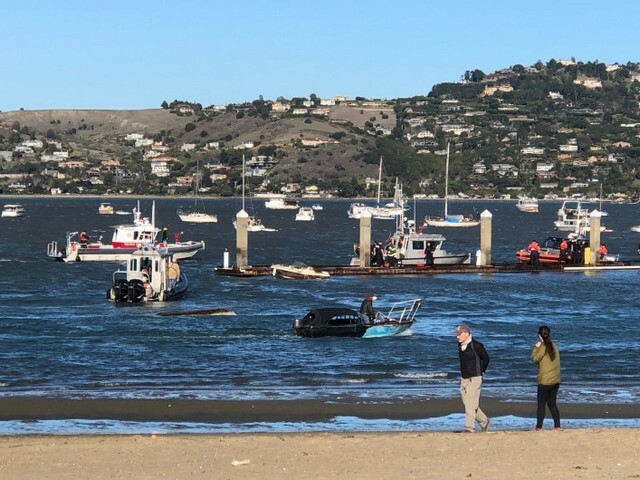 A Richardson Bay boater died Monday after falling into the water off the Sausalito shoreline, a fire official said. The Southern Marin Fire Protection District responded at 2:18 p.m. to a report of two people in the water around Schoonmaker Point Marina near Liberty Ship Way. Southern Marin and Tiburon firefighters deployed fire boats to the victims. Southern Marin and Tiburon firefighters deployed fire boats to the victims. Rescue crews arrived to find a man submerged and a woman clinging to a rowboat about 200 yards offshore, said Southern Marin fire Battalion Chief Matt Barnes. Both were transported to Marin General Hospital with moderate to major injuries. The man who was later pronounced dead is believed to have drowned but the cause of death is under investigation, Barnes said. A firefighter was injured during the rescue and treated at the hospital. Barnes said the victims are believed to be residents of a vessel anchored in the bay. He said neither was wearing a life jacket. Mill Valley firefighters, U.S. Coast Guard members and California Highway Patrol officers assisted in the rescue. A wind advisory was in effect Monday with winds of up to 30 mph in San Francisco Bay. Sad to hear that. Winds were fierce over the weekend and Richardson Bay can become quite the stirred up cesspool in those northerlies.